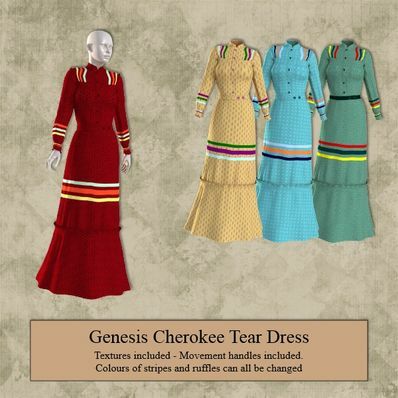 A Cherokee Tear Dress for Genesis for use in Daz Studio 4.6. Bonjour, Très très belle réalisation. Merci. I'm finally making that texture when you first made this today. LOL. I hope you'll like it. Wonderful design, out of the ordinary! Just wonderful, thank you for the extra textures, you are just amazing! You have some very original ideas. Very well done, too. Thanks for creating & sharing these gorgeous dresses.